Pets are wonderful companions for you and your family and it is a great feeling to love them and be loved by them. Naturally, you must provide for the health and welfare of your pet and in this guide, we will discuss some easy preventive solutions to keep pets healthy. Get your veterinarian to check your pet from time to time. Make sure you keep an up-to-date record of all vaccinations. Discuss the right food and exercise for your pet with the vet. This might seem like an expensive step to keep your pet healthy but it is an important one that can actually save you tons of money in the long run. Whether you own a dog or a cat, make sure you have an ID tag or a microchip embedded in the pet –it is an inexpensive treatment that will come in handy in the event your pet gets lost. If you have a microchip inserted in the pet, ensure feeding the right information in the database and updating it from time to time for it to be useful when the pet is lost. Vaccinations can help prevent many diseases in pets and are one of the easy ways to keep pets healthy. Your doctor will give you exact details and schedules about all vaccinations needed for keeping your pet healthy. Rabies vaccine is common for all pets but some other immunizations may also be necessary to keep deadly diseases at bay depending on the exposure your pet has to other animals. An essential part of keeping pets healthy is making sure that they are neither too thin nor too fat. Take the pet for daily exercise and provide good preventive care. Do not overfeed the pet. Work with your pet to ensure it gets just the right quantity of food. Exercise is especially important-it not only helps your pet maintain healthy bodyweight, it also stimulates its brain and cognitive function abilities. Spaying and neutering prevents unwanted litters and also protects pets from certain cancers. Pets that are neutered or spayed also have lesser risk of straying. Parasitic worms are intestinal worms that can lead to serious problems for pets. Heart worms tend to affect both cats and dogs and some of these internal parasites may also harm humans. So follow a strict de-worming schedule for your pet as instructed by your vet. Fleas and ticks multiply rapidly and can spread to all parts of your house. In absence of your pet, these external parasites can even bite you causing serious diseases such as Tick bite fever, Rocky Mountain fever and so on. Some of these diseases are known to be fatal. Ticks and fleas also cause intense itching in the pet leading to anxiety, distress and anemia. So do use proper tick and flea control solutions such as shampoos, sprays, spot treatments and oral medicines which your vet can recommend based on your pets health. Also adopt flea and tick control for the pets’ surroundings. Getting the pets to socialize leads to fewer behavioral issues and reduces their chances of harming other animals or people. 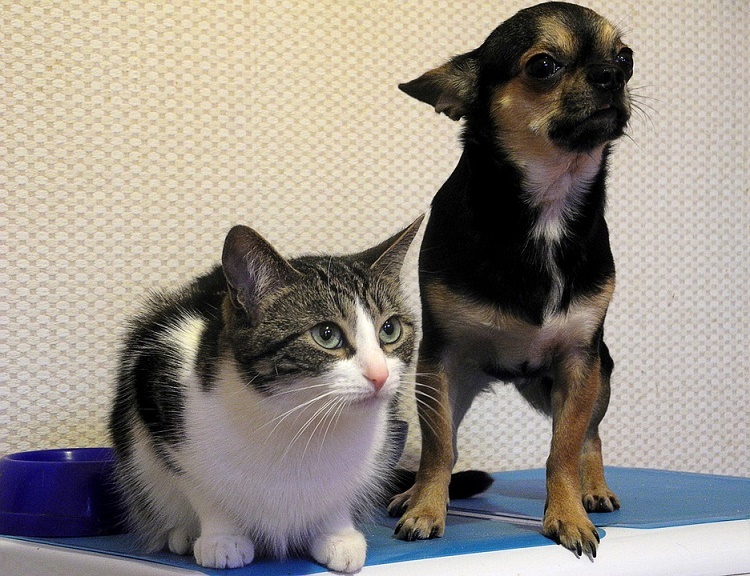 Socializing pets from time to time also stimulates their brains and keeps them happier. This is one of the easy ways to keep pets healthy. Pet insurance can come in handy in the event your pet has an unexpected illness or injury. So do shop around for all options and consider several possibilities when buying pet insurance. This can help you save money in the long run. Many human foods are actually fatal for the pets and can cause severe diarrhea, vomiting and, in some cases, even death. So keep human foods out of your pet’s reach. Especially avoid feeding items like chocolate, tomatoes, grapes and raisins, milk and milk products, nuts, onions, excess garlic, undercooked meat, yeast, fried and salty foods, raw eggs and meat as well as cooked bones of poultry etc to dogs and cats. This is the easiest way to keep pets healthy and safe. Having a pet is one of life’s most rewarding experiences. When you choose to keep a pet, know that it is commitment for a lifetime. You are making a promise to accept responsibility for the pet’s health and welfare-so you must also agree to the impact they have on your friends, family and community in general. So make sure you follow these 10 easy ways to keep pets healthy.